The Web Based Transformation Software is designed to facilitate and capture the Continuous Improvement and JOBS efforts of teams across the corporation. This page is intended to communicate those items that have been changed and included into the new release. Located toward the bottom of this page are some streaming internet training videos that demonstrate the major changes included in this release. Please be patient when using the videos below. Some files are rather large in size and will take time to load. Although it may seem like nothing is happening at times, the video is loading. Thank you for your patience. Login & User Home Page (8MB): This training video demonstrates the changes to the login screen and the look and feel of the improved user's Home Page. Link and Attachment Functionality (6MB): This training video demonstrates the next level of linking functionality. The ability to link/attach files (PDF, JPEG, EXCEL, and etc.) to CI Forms, Problem Solving and Project Implementation Worksheets is even easier and more user friendly in the new release. New and Improved Graphing Tool: The following few training videos demonstrate the complete redesign of our graphing tool used to show performance in your identified Key Measure. The new features range from the availablity to show mulitple Actuals as a "stacked bar" chart type to more freedom with data labels and entering of data in the graph itself. 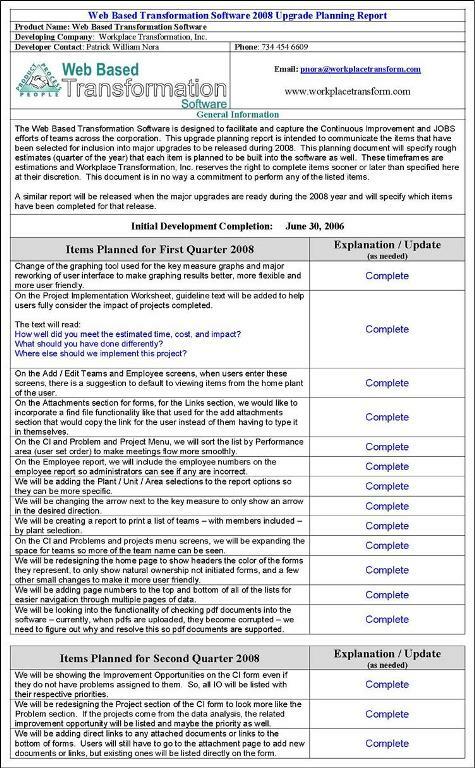 Continuous Improvement Form (5MB): This training video demonstrates the changes to the Continuous Improvement Form specifically related to Step 3 - Focused Improvement. Features are now available to show whether projects are derived from the associated data path or added based on improvement to the overall Key Measure.